Race Directing, Pacing Ultras and Marathons, Coins, Snow Boarding, CC Skiing, Mountain Biking. Skagit Runners, lots of marathon and ultras as training runs. To keep from decaying, to be a winner, the athlete must accept pain - not only accept it, but look for it, live with it, learn not to fear it." I run for my health, for solitude, and for my well being, but most of all because I love to run. The inaugural Tacoma City Marathon my first experience pacing a marathon. Annie Thiessen a Northwest elite marathoner and friend paced the 3:20 pace group with me. We laughed and joked the entire race. Annie and I stopped and did a pushup every mile until mile 13 when I noticed a few of the folks we were leading were getting annoyed at our arrogance. So I quit doing push ups she continued. I enjoy the comradery of other runners, listening to their stories, and sharing mine. It is fun for me to go into a race to pace and not feel like I have to compete. One of the guys that finished with us at the inaugural Tacoma City Marathon was really giving it everything he had in order to finish and BQ. I didn’t realize exactly how much he left on the course until the end when his wife and I had to carry him to the medical tent for an IV. About a month later he sent me a framed picture of the three of us running together during the race. What an experience to be able to give a little of myself to make others dreams come true. If you want to get to the finish line you should run with me. 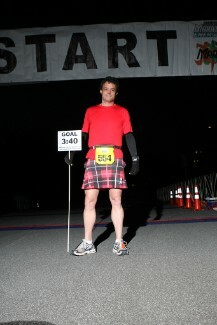 I have officially paced 4 marathons in the 3:20 pace group. 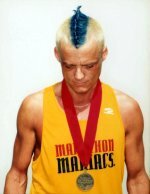 I have unofficially paced friends in about 10 marathons, 3:20, 3:15, and 3:10 pace. Plan on running a constant pace. I typically try to catch up over the first few miles to account for a slow start, a little slow down at the aid stations, and finish right on time. I will run the 1st half of the marathon no more than 1 minute faster than the 2nd half. If towards the end of the race you feel great and want to pick up your pace the last 2 or 3 miles don’t feel like you need to stay me out of respect. The same holds true if for some reason you just don’t have it to stay with me. I would love to have everyone that starts with me finish with me but in reality that just doesn’t happen. No matter what happens at the end of the race please find me so we can talk about our experiences at that point even the bad experiences are good!